Payment processing is at the core of a well-organized and profitable business. Making it easy and cost-efficient for your customers to pay for your products and services gives your company a wide range of benefits. Business owners have always relied on high-quality merchant accounts to manage their payments processing systems. The right merchant account helps manage any related risks and gives you the support you need. PayPal and Stripe offer new alternatives for today’s businesses. Although they can provide their own benefits, understanding how they compare to traditional merchant accounts could save you unwanted costs. 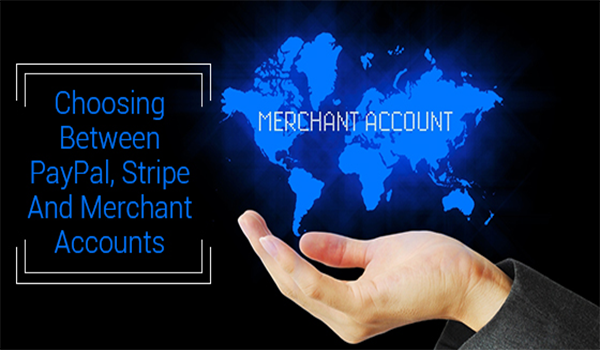 The following will help you when choosing between PayPal, Stripe, and merchant accounts. PayPal is the most well known online payment-processing platform. The service works by charging merchants a 2.9% plus $0.30USD fee per transaction. Unlike traditional merchant accounts, which charge a monthly fee, the fees paid by your business will depend on your revenue. The more payments your business processes, the more you pay in fees. Many business owners choose PayPal as a way to minimize their expenses, but PayPal can end up costing them more than they expected. Although account approval is quick and easy with PayPal, the company doesn’t gather the same information that a traditional merchant account provider does. This includes details related to your credit history, business type, background checks, or the sale and delivery of products. Credit card companies such as MasterCard and Visa understand these risks. As a result, they require businesses to obtain traditional merchant accounts when revenues exceed $100,000. Stripe is a payment processing service that follows PayPal’s fee-per-transaction model. This gives your business more flexibility when your revenue fluctuates over time. For payment processors like Stripe, there are credit card fees that they must consider. Customers who pay by American Express lead to higher processing fees for businesses on the receiving end. MasterCard and Visa apply fees for all payments including those that are attempted but not completed. This is important to be aware of when dealing with cases of fraudulent activity. Stripe’s flat percentage fee lets businesses avoid having to deal with these fees. The payments processed through Stripe will vary in relation to the fees required. But by charging you a percentage of each transaction, they are able to minimize the costs of these fees. Stripe applies a $15 fee for any chargebacks. Business owners may dispute a chargeback issue, and the fee is waived if the chargeback is resolved. The biggest difference between services like PayPal and Stripe compared to traditional merchant accounts is that these services don’t develop a close relationship with your business. By reviewing your credit history and business model, merchant accounts get to know your business closely. This enables them to give you the support you need to manage any risks you might face when accepting credit card payments. This lowers the chance of needing to withhold funds or freezing your account should any issue arise. For businesses that are deemed “high risk”, traditional merchant accounts offer a more reliable solution to their payment processing needs. Understanding the differences between merchant accounts and alternative platforms like PayPal and Stripe ensures that you choose the right one for your needs.